A3 Size 10.7 x 15.3 in. (272 x 388 mm) 11.7 x 16.5 in. Of this painting John wrote in 1975: "A large 6 x 4 foot painting is well on the way. I have worked on this at a faster rate, and now after only several months it has taken on a final ethos, which previously in paintings of this size has taken perhaps a year or more to materialize. This painting is called 'Synaesthesia - The Eternal Crystal'. It is blue, violet, grey, and has muted yellows giving an appearance of gold. The white paint is important and becomes meaningful on the brown Irish linen canvas." The background of this mandala is sprayed with light grey aniline dye on its interior, and dark grey and blue dye on its outer circumference and corners. 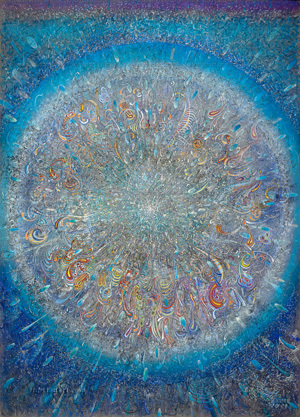 A lot of 'cosmic noise' emanates from the entire surface of this painting, which explodes outwards in chaos from its receding core, like the theoretical Big Bang that engendered the conceptual beginning of linear space and time. The picture 'Synaesthesia - A Diamond is forever' is almost complete. It still looks ethereal and fresh and I must do nothing to overwork it, as any heaviness of imagery, where relevant in other works, would detract. It seems that I have had a spiritual reawakening and strengthening. The names I am giving to my paintings indicate a strong inner feeling of contentment at the permanence of life and the universe. Pain on the emotional front with women has rebounded me back to a greater affinity and oneness with the power of light. I am also much taken at present with Kahlil Gibran's thoughts that: - "The deeper the knife of sorrow cuts, the greater the capacity to fill up the 'container' with joy". 1. We are all in the gutter but some of us look at the stars. 2. There are only two great tragedies in life, one is not getting what you want, and the other is getting what you want. I am alive with creativity. My body tingles with force. I am impregnating my painting with energy. Only one outlet can take the force. It will or would destroy any female willing to be a container for it. Thank God I have realised all this, in time. The entire evolutionary force of nature has got into my body. The sparks of cosmogony crash out all around. No wonder mandalas are appearing on the canvasses with crushing forcefulness. We learn that each thing is unique. But once wiser we see that nothing is unique in life, only life itself. Life performs an impossible balancing act every day, every moment. It is not fair that eternity should be allowed to finish first. I feel that my favourite painters have ceased to influence me but now inspire me - particularly Van Gogh.